Yesterday in Saint Petersburg, Russia, the IOC struck the decisive blow against including sport climbing as an Olympic event for the 2020 games. It was a decision that saw baseball, squash, and the sport I feel was unjustly ousted, wrestling, as possible candidates for reintroduction to the games. Although climbing as an Olympic event would have brought prestige, popularity, and spectators for the sport, I feel that sport climbing is not quite ready for it’s prime-time spotlight. It’s a sport that emphasizes collaboration and teamwork over rivalries, that represents global partnerships rather than dividing by countries, and which promotes skill, flexibility, and finesse over raw strength. I feel that an olympic debut for climbing, something that has yet to be seen on a global scale, would introduce the sport to many for the wrong reasons. I feel that climbing’s natural increase in popularity should come from a natural love of the sport and not the competitiveness that would ultimately come from seeing it on TV. Thus I feel I should state my case for why climbing should not be an Olympic event. I am not a competition climber. I’ve only participated in one bouldering competition last October and I proudly placed 5th in my category. Climbing competitions are regulated for climbers and by climbers, allowing a show of skill and dedication to a sport which has managed to retain its purity. It is no secret that the sport’s popularity is rising. It’s stars are now almost household names, people aspire to be like their famous athletes, and we’re at a time when each new young climber is pushing the bar higher and sending some of the most astonishing routes in the world. Today, there are competitions and world cups in every discipline from bouldering to ice climbing. Up until now, the competitions are not televised, they are broadcast to a specific audience, usually via YouTube, where huge arenas will cheer athletes as they push themselves harder than the last. These competitions are run and regulated by international climber federations who understand the rules, understand the mentality, and understand what it takes to make it a spectacle. I feel that under the watch of the IOC and for the sake of a wider global audience who might not understand the sport or for which the sport might be too slow for them, many things would change and for the wrong reasons. Sport climbing is a slow and meticulous challenge. It’s not about racing up the wall, jumping from one boulder to the next and storming up the face. It’s a methodical thinking game about bending over to find the perfect position and clipping the line. I feel a televised Olympic sport would have to be fast and exciting. The Olympics, which celebrates the human body and its potential, would put emphasis on muscle over mind, making climbers, who are regarded as thoughtful, methodical, and intelligent, into muscled athletes racing up the wall. The sport has already seen it’s debut in the X-Games, where the focus is speed, being faster than the opponent, and forcing the way up the wall. As exciting as it is to watch, for me it takes everything out of what makes the sport beautiful. No precise feet, or fingers on a credit card sized crimp, just one massive pull up after another. 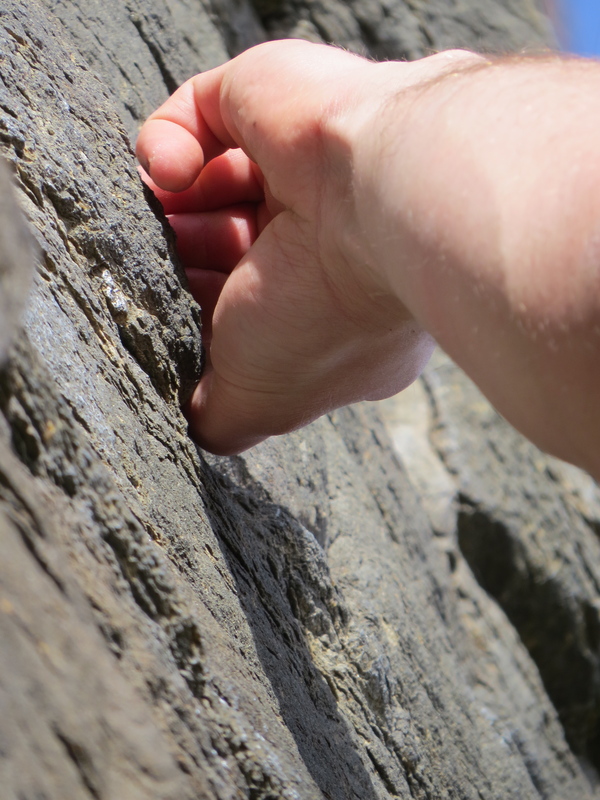 The beauty of climbing is being able to latch on to small holds. It celebrates precision over power. When I competed, something extraordinary happened. I went into the competition with the mentality that I was on my own, that only what I had learned and practiced was going to help me. But there was something that is so unique to the climbing world that made me remember every reason I wanted to get into it: collaboration. Climbing is a team oriented sport. 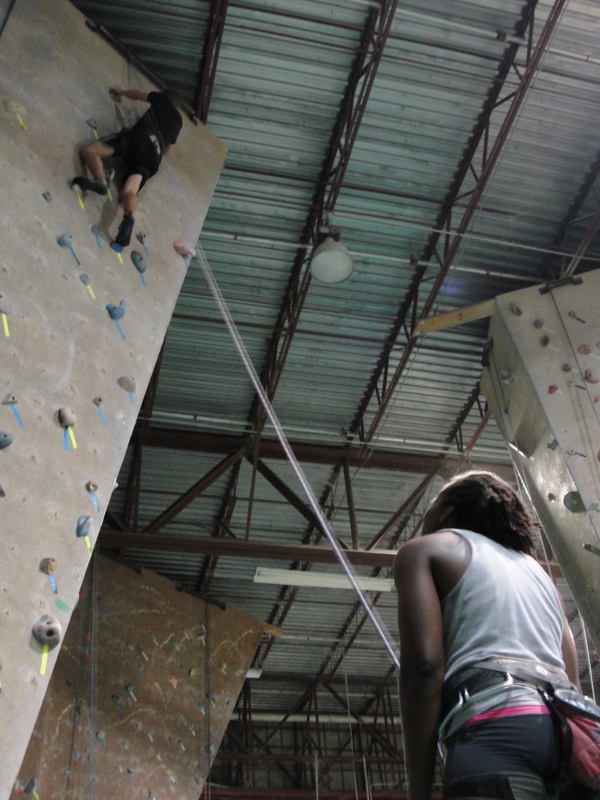 A belayer and consistent partner is trusted like a best friend. One of the best attributes to the sport is its social aspect. An Olympic event would promote competition, and I imagine a tv network would manufacture rivalries for the sake of making it more exciting. When I competed, not only were there other climbers cheering on others who were in their same category, but some were actually assisting others on tough moves. We strive to make it accessible to everyone, to push each other to break our limits. In any setting whether at the gym or at the crag, a struggling climber can expect encouragement and cheers from people they just met. 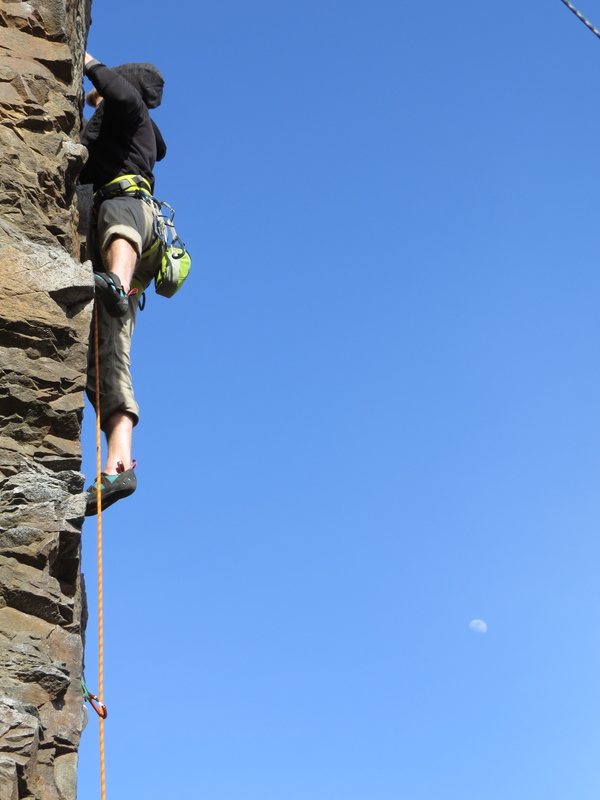 An inexperienced climber at a competition can expect support from senior members always forcing them to move further or giving them advice on how to land a certain move. I feel to a worldwide audience who would clamor for rivalry, this would cheapen the spectacle. Climbing is a global sport. It’s as much about partner and friendship as it is pushing up the hardest routes possible. An Olympic event would surely break the competitors down by country. The commentators would speculate about who produces the greatest climbers in the world, and this defeats the purpose of international cooperation. Some of the greatest partnerships, the ones that make the sport exciting, come from two climbers who learned in two different styles, on two different faces, and sometimes two different continents. 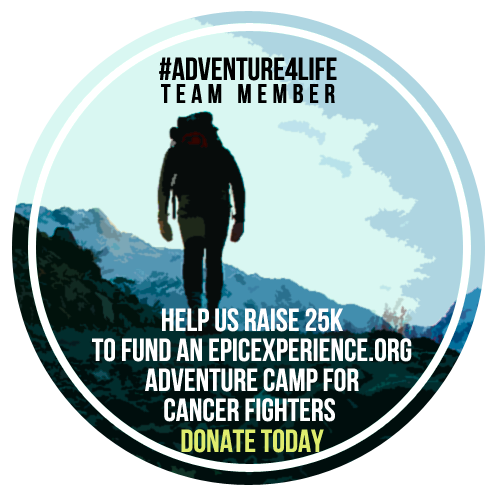 I’ve been lucky to come in my own having partnered with climbers throughout South America, the Caribbean, Mexico, England, and Spain. Each approaches it with a different methodology, each with a unique style, and dividing the sport by nationality would add a useless country to country rivalry as well as taking the excitement out of a colorful multinational partnership. Climbing promotes cross gender and cross national partnerships. My final argument against climbing as an Olympic sport regards its future. There is no denying the growth of the sport and there is no denying it’s becoming more popular as its athletes perform astounding feats, but it should grow for the right reasons. Since we spend a majority of our time outside, we climbers take pride in proper ecological stewardship. As I said before, the Olympics would fiercely promote the athletic aspect and endorse excitement and strength but with the inevitable popularity of the sport post-games, there would be little to no environmental education. Our favorite areas are already becoming dangerously overcrowded, with Joshua Tree being scarred and defaced and weekend groups leaving trash at remnants at some of the most pristine areas. The organizations that run the sport and protect the areas, such as the Access Fund, teach climbers ethical stewardship of the places where they climb. The fear would be that such a massive influx of new climbers, pushing to get outside would cause new problems and throw off what is already a delicate balance between climber and environment. Climbing is a beautiful sport. It emphasizes cooperation, international partnerships, and responsible ecological stewardship. An Olympic event would cheapen these attributes to make it accessible to a wider audience. I applaud the IOC for keeping the sport pure, for keeping it in the hands of knowledgeable climbers. Of course we want the sport to grow, we want everyone to see why we love getting out every weekend, why we love sitting off towering cliffs, and the friendships that we forge in gyms. But the growth should be natural, it should come with proper education, and a promotion of the non competitive nature that makes our sport sacred. I wholeheartedly encourage opinions and rebuttals. Do you think climbing should be an Olympic sport? Tell me in the comments below.